Units and dimensions; Density and specific gravity; Fluids; Viscosity; Rheology and texture; Surface properties; Thermodynamics; Heat changes/transfer; Gases and vapours; Electrical properties; Diffusion and mass transfer. 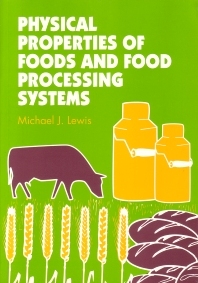 This book is an invaluable introduction to the physical properties of foods and the physics involved in food processing. It provides descriptions and data that are needed for selecting the most appropriate equipment in food technology and for making food processing calculations.